Photograph by Dustin Snipes. Inset Photo: Herald Examiner Collection/ Los Angeles Public Library. 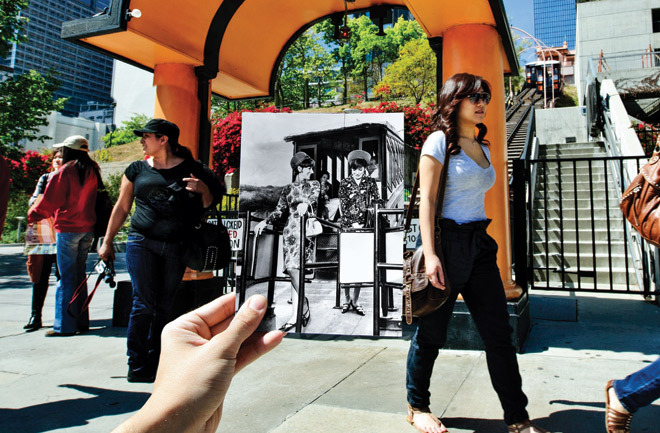 The first trips aboard Angels Flight in 1901 were shaky. Mayor Meredith Snyder had one hand on the dashboard and another on his pistol, ready to blast his way out of danger. The funicular transport was built to move affluent residents from Bunker Hill to the street below and quickly became a cherished landmark. So cherished, in fact, that a business group promoted downtown on the railcars by hosting tours, lectures, and fashion shows—the stylish “passengers” (above) are from 1965. Four years later the cars, named Sinai and Olivet, went into storage to make way for California Plaza. They began rolling again in 1996 but were halted after a fatal accident in 2001. The railway is back up and running now, and safer than ever.